I went to the Make It show at Farnborough. Now before I give you a big old run down, I need you to understand that I have the luxury of a super, well stocked craft shop less than 3 miles from my front door, and others within easy access, and so I have many and frequent opportunities to stroke and consider before I buy. I realise that lots of people don't have this luxury and that's why the shows like Make It are useful. So with that as my prologue, you kinda know that I'm going to whinge! But not really. Sort of. Less whinging and more observing I think! It takes about an hour to get to Farnborough from here; no major journey, and in getting there, I have to drive past the end of my Mum's road, which is a bonus visit, doncha think? For her or for me - you decide. Because it's relatively close, I don't really feel I'm putting myself out too much to go, which is just as well, because I wouldn't want to have had a longer journey, or taken a day off work to pay £9.50 and be ready to leave in 3 hours (including coffee). It's not an attributable fault - the number of stands was probably the same as last year, indeed a lot of retailers were in the same stand positions which is probably helpful. It fills about half the massive marquee type structure, was warm and dry and the light was very good on this lovely bright shiny day. I think actually, a lot of the reason is that there were very few demonstrations. I KNOW that there aren't many of us that need to be shown or told 'how to' exactly, but there's a magic in seeing the product in use that draws you to it...just like product loaded samples, they sure help me to buy stuff! I mean, how many of us were glued to QVC this week, just to watch? There was a stand with an end aisle 'wall' of packets of unmounted stamps - absolutely loads of 'em. No samples. No inspiration, no wow factor. And there was a stand with some potentially gorgeous kits and the samples were tatty. (Not terrible, the work was sound, but they'd been over handled, probably at a couple of previous shows) and it lets the product down. For two reasons; first because we're all looking for inspiration and as I've just said, samples really help to sell. But second....and I am totally prepared to be wrong about this -in fact reassure me - it's a bit cynical isn't it, to load up your stand with product and not include any samples or a demonstrator churning out samples. Does it smack of 'oh well, they'll buy it anyway'? Again, don't shoot me down too fast, I'm an ex craft shop owner; I know the retailers are in it for a living and a profit has to be made. But not having a passion for your product - or finding someone who does to make stuff for you - means that you ain't promoting it right, and I ain't buying it. I didn't leave empty handed though: one sheet of American Crafts paper (to be cut up and Diamond Glazed into epoxy style buttons), one Maya Road album (no plans), one tin of clear buttons, (I have a plan for them, sort of) two rubber stamps (come on, you knew I would) and an iron on transfer (yes, there's a teeny bit of a plan). Not exactly a haul! Was I strong or was there nothing much.....the Prima papers were gorgeous, but the prices were a bit silly for me, when I consider how much stash I have to use. So that's it. Tomorrow will be very very busy, no doubt. Here's a tip. Use the words 'Excuse Me' and set a good example; I was a bit embarrassed by the amount of shoving in the aisles. If you're behind someone, they will not know that you need them to move unless you ask! And this message goes particularly to anyone who feels they're old enough not to have to worry about their manners. Wrong! Whatever you plan, have a fab weekend. Personally I'm going mourn the end of the Winter Olympics and have to get used to not seeing so much of Graham Bell on the tv. Oh those laughter filled crinkly eyes! Oh that grown up Hary Potter type naive appearance. So like Mr D! Lawks, forgot to credit the card: ippity stamps ( a baby sister to Unity) and the text is a clear sticker from SRM. They are delicious. Both. So here's a starter for hundreds - the ippity stamps have been utilised and I like them very much....well cut, neatly mounted, deeply etched. Yum. The text stamp is by Wordsworth; I'm saving the ippity texts for another day. When they suit the card I'm trying to work on perhaps! Text is a weakness of mine; one of the reasons I got into scrapbooking was the journalling potential. Leaving all my blether for future generations is an irresistible idea! Of course, that would imply that I have a sense of self-importance that may be slightly exaggerated. Moi? Bit like blogging really, it's all about affirmation innit. 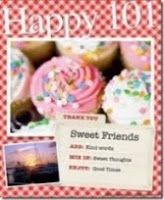 I'm sure I've mentioned before that a friend once accused me of being unable to make a card without text on the front. She was probably right; my collection of text, word and alphabet stamps is probably the one 'section' of my craft room that I would have to immediately replace after a fire; I would be lost without them. Of course, even as I type, I realise I'd need a new glass mat, guillotine, heat gun and a fairly long list of 'basic tool kit' things - which raises a whole other question. Just what is a basic tool kit? Do you include inks and stamps? How many pairs of scissors? Glue and foam pads? What do you include for colouring - or is that a luxurious extra? Is my difficulty in collating a basic tool kit list because I have so much stuff that I've lost sight of what I actually need, or is the reason I have to drag a super sized tote bag to a crop something to do with indecision? I mean, often in a restaurant I can't decide what to order before I know what everyone else is having. Is that the same? Is it indecision or nosiness? I dunno. You tell me what you think and then I'll decide. Me and The Colonial are going to the Make It! show in Farnborough tomorrow. Anyone else? In the interest of good taste: Make It! is a paper crafts show. There may be other stuff. But I'm incredibly confident that none of the exhibitors will be of the variety that could justify the smirk on the male youth's face when I called the show by its name this afternoon. I mean, would I really put myself out for a day of smirk inducing Make It! I know this answer, so maybe I'm not so indecisive after all! What's On Your Work desk Wednesday? (unusual) and came straight home. Changed the sheets and tidied in the kitchen. As I was sweeping the floor (an everyday, OCD type necessity for me), I was running through the things I want and have to do today and over the rest of the week. It wasn't until I'd come in here to chuck some paperwork in front of the computer that I realised that it's Wednesday! How horrid - I hope the real life stuff that is clearly distracting me soon lets me off the hook! So here's the desk...I'm adding pages to Miss Dunnit's 12 of 16 album. The stickers are Paperchase of cours e.
It somehow looks tidier from above, which is probably why for the past few weeks some of you tidy natured types have been able to breathe a sigh of relief as you've clicked over to this blog! You can just see my lovely new Ippity stamps and next to them the kitchen timer. I use this alot - frequently I start to cook something and then wander back to my desk...a loud, makes-me-jump, interrupting bell is the best reminder - the only other one is the smoke alarm! I have one last swing as well - in terms of cupboards and well, room to swing! On the counter you can see my underused Cricut and my overused guillotine (I have an evangelising preference for the guillotine against the paper cutter style...it is I suspect, a passive aggressive thing!). You can also see a boxed up and ready to return Letterpress kit. It was loaned to me by the Shopkeeper gal. Fair to say that you wouldn't really want me to review it. Because I'm a sausage fingered impatient old whinger, the review would start and finish with 'messy'. In the sliding cupboards (ably decorated by Miss D and her baby cousins) are the card stocks, envelopes and blahdy blah associated with conducting workshops. Although, since sorting out my scrap box, I can honestly say that I haven't cut into a sheet of A4 card unless it's been to supply pieces in a workshop kit. Yahoo. Come on then- get your camera out, point it at your desk and show us what you're working on. And what you've got. And if you want to - swing around and show us some other part of your workspace...it doesn't have to be a dedicated surface or room...part of getting to know you is seeing your space, huh? There's a (ahem) membership button in the left bar of this blog if you want to be identified as a WOYWWer. I'm thinking that since it's done no harm and forged some friendships that it's not the embarrassing, nerdy thing my husband thinks it is. So there! Leave a comment here and we'll click around and visit. And next week, I promise. I'll take my head out of my erm, kitchen chores, and sort out Mr Linky. I think the time has come. I never met a box I didn't like. The whole take-the-lid-off-and-look-inside-even-though-you-know-it's-empty thing, the potential of an empty thing to become a full thing, full of anything, something, but certainly interesting - and usually mine. Boxes are exciting. Baskets too, but the lid-less-ness can be a bit of a betrayal, non? Anyway. Look. The Slipper Lady bought me this. I can confidently say that it was her gift of choice for several reasons. Most of those reasons are connected to the frequency and volume at which I express my opinions. Shall I break it down a bit? Might as well, you've read this far. First: It's from Paperchase. So eventually, as a gift or not, I would have to have it. It's enshrined in the laws of Julia World. Second: It's a useful box to put things in. And I have things. As discussed yesterday! Third: Slipper Lady knew that the first thing I'd do was take the lid off for a l ooksee, so she surprised me with this note. See I don't know if you know my opinion about altering, but it's become a bit of a joke (well, OK, I'm the joke, my opinion is the punchline if you like.) I cannot get my head around 'altering' as a description of what goes on in loads of creative hands. Tim's 12 Tags for Christmas for example, - they aren't altered, they are certainly painted, decorated, embellished and beautified, but they are still tags. See - if you took a baked bean tin, coloured it with some alcohol inks and added some pretties and the process turned it into a small family car - I would happily acknowledge that 'altering' had taken place! Anyway, my near friends have learned that the easiest way to deal with my opinionated arrogance is to ignore it, challenge it or take the mick. Happy about that. So dear Slipper Lady, even though Mr Dunnit was moved to remark that my lovely box was just going to be 'junk within junk', you should know that I'm pleased with the box. Storage is, after all, the second hobby of every crafter I've ever met. And I shall probably opt for your get out clause...although the desire to doodle is quite strong..! Now, I have to go teach Mr Dunnit the difference between 'embellishment' and 'junk'. Really, it's getting offensive. If he knew how much of our joint income was invested in my stash, I'm fairly sure he'd change his mind about calling it junk! Sit still a minute while I describe somebody: enormously patient, indeed some would say long suffering. Hugely talented, kind and has the soul of a craftsman. So loving that he rarely uses my real name - he calls me 'Darling' and I just love that. So, with all these very special qualities, you recognise Mr Dunnit. And no doubt you are right now, congratulating him on finding a splendid and totally in tune partner, huh? This card, for example, is all wrong for Mr Dunnit. Let's break it down a bit; there's the gorgeous and I-can't-own-enough-and-indeed-am-actually-using-it-it's-so-nice flocked ledger paper from Making Memories. The presence of any sort of prettied up office supplies serve only to improve my life. Mr Dunnit feels that it sort of loses its point once you pretty it up. And he goes deaf when I explain that's partly the point. Huh? Then there's the use of a staple. For me it goes hand in hand with the echo of the ledger paper and is perfectly fine for anchoring down one of the two flowers I've used in the last quarter. For him it's utilitarian mixed with pretty and doesn't work. This may well be the case for a lot of people, I can see that. The pale stamped ticket image (Inkadinkado), scrumpled up and added behind the main image doesn't, as I intended, talk to him about the potential for journeys and travels and romantic, as yet unknown far flung destinations. Nor does the torn book page and lace speak of the romance and mystery that go with such things. I must say in fairness to him, that I wasn't exactly in that zone myself when I made the card, I just liked the stuff and the way I added it! But hey, I can reach deep inside my creative being and fathom a reason; if an unmade bed sits in a national gallery with a deep meaning, you can rely on me to find one for a handmade card! The main image, (again, Inkadinkado) he agreed was a great one, iconic. But why didn't I cut it out square, stick it on straight and just leave it like that? Well, the answer to that is really easy - I can't cut straight to save my life and if I stick it at a jaunty angle, it will draw the eye from any other horrid design mistakes...... but of course, I told him it was simply more artsy my way. Mr Dunnit, gazing around my workspace, more in shock and awe than wonder and admiration, simply said that if those 'bits of junk' were the biggest bits I ever put on a card, it would take a while to work through all my erm, 'big junk'. By which of course, he means stash. I get it. He doesn't. That's OK. It means I don't have to share, and as a middle child, that is a lifetime's reward! Meet us. The Dunnits, to you. As you know, that's not really our surname, it's my sign-a-card name, as in Julia Made it. There's a few of us using Dunnit now. Feels good. Mr Dunnit and Miss Dunnit were incredibly luke warm about the result. I just love it. It is in my workroom on the wall facing the doorway (no door) to the lounge, so it can be seen on approach. It makes me smile. Because it's us. But it's not. But it is. I like it so much that I remember to hoover along the top edge every time I do domestics. That's a good sign! Interestingly (no, really) most of our visitors fall into two camps - the men are very luke warm about it and the women like it and remark upon it. It doesn't matter of course,and I have no scientific evidence for my next statement, but it clearly is a girl thing, this sort of manipulation. I couldn't possibly comment about other sorts of manipulation. 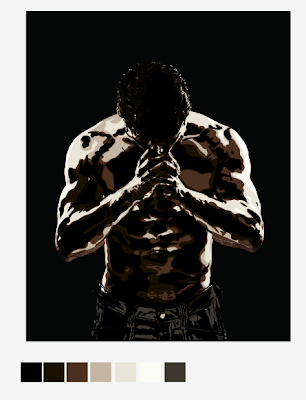 Now I know you can have a photo printed onto canvas easily, almost anywhere. But before you do, consider a bit of manipulation too, not from vanity - unless you too have a bloody cow lick to get rid of - but for fun! I've told you all this because two people mentioned the picture as a result of my WOYWW photo yesterday. Sorry if I made your eyes glaze over. It's a skill. The moral is don't ask - there's ALWAYS a story! The digital work was done by Gabi and her website was eggbean.com...but it's currently unavailable. I'm guessing that the arrival of a baby has caused a temporary halt to the business. If you're reading this Gabi, let us know! IIWA? What's On Your Workdesk Wednesday? Good grief, half terms seems to have accelerated the week. I'm delighted to offer you a double whammy this week! Actually it comes in the form of making up for genuinely bad photos of my work space today. When I switched my camera on this morning, it told me that the memory card is locked. Well I didn't lock it - well, I didn't deliberately lock it.......And as it was empty bar a couple of photos of cards for goodness sake, why would I lock up 4 gigs of memory. Man, I'm a bit cross about that. Anyhoo, Miss Dunnit is up and around already and lent me her camera...but I am unable to refine the settings in the time I have before real life takes over this morning! Remember on Monday I went to see The Colonial? Here's her desk. Fair to say that she works in the 'push back' style so that she has a square inch of space on her cutting mat. Works for so many. But it's a great desk..full of stuff you want to look at, I can assure you. I did not ask permission to swing, she seemed nervous at my photographing this! But of course, eventually she'll let me. Start slow and sweet.. ..! And mine is here..over exposed and not very exciting! The magazine has been pushed back to let me work on the glass mat - I must have been cutting with a scalpel..I use the magazine when I'm inking papers etc..saves me having to clean the mat. The faithful bottle of Primas is still there, just behind the buttons; neither have been used this week at all, but if they're in my line of vision, you never know! I've been adding some more stuff to the the 12 of 16 album; I actually cut into the A3 polka dot acrylic sheet I bought from Paperchase to make a page. I've had it 3 months, and it's getting in the way now! No doubt you'll see the pages when done - I do hate a blog post without a picture ! And here's the left hand swing again...a bit further left this time, you can still see the ribbon jar which was the edge of last week's 'swing', and I've opened the other two cupboards so you can see my papers and, on the bottom right shelf, terrible punch storage! So now you can also see where I'm sitting as I type this rubbish. It's a terrible photo, but, I guess as its not exactly the most interesting of subjects, it won't matter too much! So, come on then - show us your workdesk/lap tray/sofa/floor - whatever surface you work on; we want to see what you've got , what you're doing and to a certain extent, where you store it all! Put a photo on your blog and then leave a comment here to tell us where to find you. Be warned, we'll come and look! There's a badge on the top left of this blog if you want to erm, go public as a WOYWWer. This digi image came as a gift from Nikki and I love it. Although I have to get some decent paper to print it on, this regular copier paper makes the Copics bleed horribly! Anyway, I couldn't resist using her, bleeding or not! I have a handful of stamps that perfectly match Madison's expression too, so there'll be more of her! That wide-eyed, slightly wild look is appropriate too as I thank you for all your comments and input yesterday. Steph and Dori are really grateful; but in total overload and it's my guess that it'll take a couple more committee meetings before they can announce! Here's me alpha inchies too - stuck to the cover of yet another notebook..I'll probably get round to using this in about 2015 - if I use them up in order of acquisition! Lots of us started as stationery junkies I know - a way to be in touch with that whole paper/colour/create thing that lurks within before you stumble across what it is that makes your mojo tick. I started with stitching, but rarely do any now. Since I aged and have to wear glasses (especially at night) for the close work, I doubt if I'll hurry back to any sort of stitching in front of the telly. Of course, if I'd persevered, I could by now be knitting up a storm - there are a few evenings when I don't want to sit at my desk in pretend light, but sitting in front of the tv with nothing else to do makes me fidget and get cross! I can knit (badly) but not without looking (much like my typing!) and so I'm at a bit of a loss....what do you do? What would you recommend for me? A nap, and get over it, probably! But whoa, this isn't an open invitation, remember, this is my blog and therefore in the main, restricted to my opinion - otherwise I'll have to admit that life may not always be about me, and I'm not ready for that! However, sissy Stephanie and Dori, her partner in all things design are at the stage of having to apply names to their start-up and it's incredibly difficult. And for reasons of flattery, they thought of asking you! Now here's the thing: I'll give you the short brief and a list of potential names. Please leave a comment (if you feel so inclined), indicating your preference, or indeed if an idea pops into your head, tell us that too, negotiation is everything! 'Dori and I are trying to come up with a name for our new design business.... It's to target scrapbook and textile audience.... We were wondering if you would post the names on your blog and do a mini poll for us...'? In the next couple years, I fully expect that you'll be looking for their scrapbook products in your local stores; so it would be fab if the name you're looking for had your help in these early stages, huh? Thanks for that; fun, interesting and helpful. What every blog post should be. But around here, very unlikely! So back to me then. Phew. Was starting to get the shakes. The lovely Pam shared her award with me (from her iphone, which is a little too jealous-making, to be honest). Thank you, Pam. 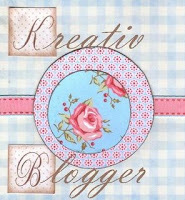 You can see from the way I wear these badges on my blog, I have no modesty and I'm truly flattered. But I recently gladly received this badge from others (honest, it's costing me a lot of money) and so I'm not going to put you through my normal acceptance ceremony - although I'd love to really....I think it's about manners, and boredom thresholds! NOw, I'm off for a real life WOYWM - my friend The Colonial has invited me for coffee. She didn't mention the rummage, but once I'm there....ha! Somebody stop me (and possibly my camera!). The card features a new Cuttlebug folder, versamark ink and bronze Pearl Ex - and that incredibly yummy ribbon. It's part of Thursday's 'Vintage' workshop in Tidworth. That would be my take on 'Vintage'; rather inevitably it still includes colour...I just cannot do faded and elegant! I have just finished the third-in-a-row Tunnock's tea cake. If you don't live in Great Britain, you need to know that they are domes of soft marshmallow sitting on a soft biscuit base, totally encased in chocolate. The skill in eating these is to bite off the base, eat it (of course) and then remove the marshmallow without using your fingers, so you have to contort your tongue. Sorry, but you do. AND all before the chocolate shell starts to melt from being held. Oh yum, and oh hell. Knowing that I can eat two, maybe three without even breaking my stride means that I don't buy 'em. But this afternoon, I was in the Co-Op doing village gossip with a friend that works there and I spied the teacakes on the shelf behind my chum. I stopped hearing, my vision became all tunnelled and panicky - they've changed the packaging! Oh Lord..please don't tell me that they aren't any longer a family business, established for over a 100 years? Not them and Cadbury's in the same month, surely? Nooooooo. Phew! Investigations reveal that the colour change to the packaging is because this particular batch of yumminess is encased in dark chocolate. Oh be still my heart. Somebody shake me. The sweet sticky white messy meringuey marshmallow offset by a dark, possibly slightly bitter chocolate. I can't, cannot, will not be able to think of anything else until I've tried 'em. So, gossip be damned, I headed off to the till armed with my new chocolate friends. It was all I could do to walk home before I ripped the box open. They are, without doubt, perfect. And therefore, another product on my 'do-not-buy-if-you're-going-to-be-alone-at-home-with-them' list. Because of course, I can hear them calling my name, even above the sound of the radio and my own, massive will power. Creme Eggs are on the list too. My own sense of embarrassment makes me stop at three. But I won't be sharing them. No sir. And the last one? Will take ages to be eaten...ages. Because it may well be the last one I ever buy. I can't share the gossip either. But that's because I can't remember a word of it. Share your love then....tell me your guilty sweet secrets.....I can't absolve you, but I won't tell another living soul. Now y'all, before we start, wave hello to Angie; she's joining in vicariously, and as a founder member of this cultcirclething, it's very important to know that she's there! Real, genuine hugs to you, gal. This is my desk..I'm working rather tidily - for me. Don't worry, it'll change! I'm working on cards for a Workshop entitled 'Trees'. Had a bit of a block about it because when I last visited the shop for a coffee morning, Mrs Precision was using the same stamps (you can just see them, from Kanban). And she was using them to brilliant effect. Mental block, crisis of confidence..call it what you like, it was definitely a hump to get over! Those little tubes at bottom right (caught in the flash, so not true colours) are fantastically fine glitters - dust, almost. I'm about to start mixing them up a bit. You may or may not see results at some stage. So then, face my desk and swing left, camera please. This was taken at the same time as the desk shot, but the lack of window makes the light change dramatically! SO you can see..I have cupboards to hide all the stash in..cuttlebug, dies and folders always to hand, and erm, a small ribbon jar. When I planned the cupboard space, I had saved up a shed load of money and was going to use the white draw/shelf storage system you can see on the right. Mr Dunnit suggested just buying a few bits to test run (which you can see). It didn't work out as satisfactorily as I hoped, so that right hand set is all I've got. Mr D then made slide out shelves which are perfect. The cupboard you can see is home to embossing powders (top shelf) and each basket is a different variety of ink pads. I know! The white drawers hold small tools, sticky stuff, metal embellishments, blah blah. I'll close up next week if you like. All the crap under my desk on the right is stuff I should use but don't and can't quite part with. Oh, and some demo tools, waiting for the day! 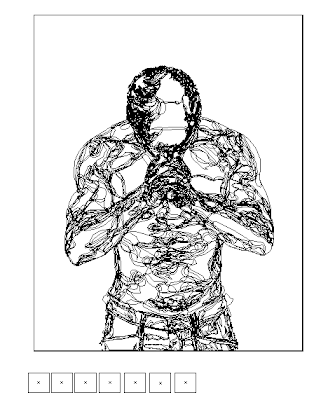 Stephanie Dunnit has been working digitally this week..this 'Man in Prayer' image is the first and last layers of a sketch design she's doing for her course. OMG. I can't pretend to know about digi - I know lots of you do. But I recognise that overwhelming feeling of how awesome an artist my Sissy is. Amazing, huh. I like to think it might be diet Coke man, praying for a lift to break down at my house. So that's us. Show us what you're working on - upload a pic to your blog, leave a message here and we'll trot round for a visit. SWING, if you want..show us another space in your room so we can look at what you've got! If you aren't too embarrassed by joining in, snaffle the button from top left to wear on your blog. Why not, it's totally harmless and as close to a membership card as you, or I, can get! If only I didn't know the answer to my question! It's not about internet shopping as a preference to visiting bricks and mortar shops, nor is my question about your groceries. They are a given; you have to have 'em and it's highly likely that you are involved in their purchase. It's about your stash. I don't want to hear, and frankly won't believe you if you tell me you shop out of need. Unless you need glue or tape and that's all you get. I want to know if you're a regular visitor to your shop, to browse and pick up stuff that looks interesting nay, inspiring? Or do you do the 'per project' shopping? You visit the retailer to get bits for specific jobs, papers to match a particular event's photos, a stamp for a particular greeting. Do you go shopping' when the mojo is low - does new stuff inspire you? Yesterday, Jo told us she was having a good chunk of money for her birthday; what should she buy? Of course, I gave her my opinion. She asked, honest. But I've changed my mind of course. I think now I'd squirrel it away.....and wait for the shopping moment that I haven't yet mentioned. That one where, despite the impracticality, colour, limited use, similarity to something already owned, despite the lack of immediate use, there is an item that you just plain WANT. And then, having the money to treat yourself to it, for no other reason, is the best sort of shopping. I did that this morning. Cuttlebug folder. Nothing major, immensely fulfilling. And so, to tidy up and have a play. Well, OK, to play. January..six in the morning. 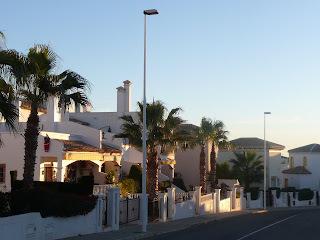 Sunshine creeping over the villas on Calle Trufa. Looks like it's going to be a lovely day doesn't it. We're a bit desperate for some sunshine and our thoughts have definitely turned to holiday plans. If yours have too, you might like to throw this villa into the mix; part of my remit as Domestic Goddess is to be in charge of renting it, and of course, my own blog is the best place to pimp! It's a 3 bedroom villa in southern Spain, nearest airport Alicante, about 40 minutes by car. Alicante is a 2 hour flight from Gatwick. Shares a community pool, has a patch of garden, a front balcony and a large solarium balcony on the roof. It's a sh ort walk from a Plaza full of shops and bars and a short drive from golf and the sea. Drawback? You need to rent a car in our opinion; you can easily get a bus from Plaza to beach etc, but a car will of course, give you access to some amazing places, especially beaches. The villa is on an Urbanizacion about 15 minutes from the nearest town, Torrevieja - it has markets, fun fair, fantastic board walk, all the things you expect from a spanish town. Although when we last went, we managed to be there for a week without actually going into the town; no particular reason, just didn't get around to it! You can also go for a week without uttering a single word of Spanish if you need to - although of course, there's plenty of Spain to be experienced too. The rooms are doubles; one en-suite and there's a sofa bed and Zbed too..we have slept 13 for a party weekend. The Villa costs £125 per week to rent, plus a weekly cleaning fee. It's cheaper to fly on a weekday - we have no rules about what day rental starts and stops - and it's a pro-rata charge, so you can have as many or as few days as you like. If you've an interest, let me know - contact me by email from the button in the side bar. No obligation of course, just another option to add to your lists! Edited to Add : the rental cost is for the villa, not per person. There is a seperate weekly fee for cleaning, payable in Euros, on site. Otherwsie I think that's the only thing I didn't make clear! On a Saturday? Don't I ever shut up? No........not when there's bragging to be done! See this card here is also to be found over at Susie and Vikki's Christmas Club, as the card by the guest DTer - with my name on it, and with ridiculously flattering words from Susie! Why wouldn't I blog about that! So this is a Christmas tree, (yes IT IS) and explains all the hearts on my WOYWW desk and the star shape explains the grasshoppers; for Ramona, anyway! It remains to be seen then, if Mr D will receive a card covered in hearts next weekend. It's unlikely to be honest - the hearts that is, he'll certainly get a card. From someone. So whilst I'm in the inflated head mode, I need to acknowledge and thank Wipso and Chrissie and Paula, for generously passing on this award. They all got the money and so said some incredible untruths about me. There are strict rules with this and as I seem to be all about shirking, I thought really I ought for once to step up and prove my gratitude. 1. I am a naive idealist. 2. And I've learned to be a horrible realist. 3. On the inside, I'm a neat size 12. 4. My favourite colour is yellow, it cheers me. I don't wear it though, it kills me. 5. I was a child bride. Yes I was. 6. It took me 3 goes to get a Driving Licence, but now I'm the best driver I know, naturally. 7. I read 'relocation' type travel biographies to satisfy a wanderlust. Man, I'm so interesting. So now, I'm obliged to pass this award on: this is hard, because most of the people who have blogs that I read are more creative in their daily lives than I am in a week... but hey, am happy to share a good blog! This is one of the cards from yesterday's Pretty In Pink workshop. I have to post it because in preparing the cards for the workshop, I misjudged how long the paper piecing and painting would take and it all fell apart and for the first time in ages, some gals went home with unfinished cards. So if you're squinting at this trying to work it out - sorry! I made it slightly easier by pre-cutting all the nonsense pieces out for everyone (12 times then), so that calms the guilt a bit! The design of the card is a less complicated (!) version of an original by Sheila Halliwell. So the workshop for this week is over and I must turn my attention to tomorrow's crop. I know what I'm going to do (for a change) and so it's really a case of unpack and tidy up after workshop preparations and then re-pack. That'll take up all of my craft time today....that big basket of stamps waiting to be cleaned that you saw in my WOYWW photo is on the list too. At last! some of you will joyfully shout! That's the thing about going to a Crop....everything I work so hard (I do, too!) to keep in check, tidy, reachable - indeed, findable, has to be reduced and decanted into something smaller than my car so I can go and do the LOs elsewhere. Honestly, by the time I've packed, remembered the beverage bag, lunch, goodies and a warm layer, it would be so much easier and logistically more sensible to stay at home and scrap alone. Not to mention probably more productive. I mean, I truly hate the packing part....put it off too long though, and you end up taking twice as much because you're in a hurry. The need for speed really impairs your judgement in packing anything , believe me! So why bother going to a Crop? Especially the grandly, eloquently and imaginatively named 'Ludgershall Crop'? Company. And a chance to let a conversation finish instead of cutting it short because one or other of us has to be elsewhere. Ludgershall Crop is small. Some months it's difficult to guarantee the five people that are needed to cover the hire of the hall. But that's OK. We relish the space. It means we can welcome other people without needing to worry about venue size! Call it what you will - cropping/scrapping/crafting in company is one of the greatest pleasures - even if you have nothing else in common, there's this paper-scissors-glue bond that instantly makes you part of a community, and for a day, you can immerse yourself in it : talk about it, admire other's stash, browse other's albums, borrow other's ideas, eat home-made and possibly even construct a LO or two for yourself. Why wouldn't you, if you could? There's no need to assume you aren't living in or near a craft community of one size or sort - if you want to, you can find it, get involved, immerse yourself. You'll love it. This lecture came because I was in WH Smith last week trying to bring myself to part with £6 for the February Scrapbook Trends mag. Squatting, as if to worship at the rack of hobby magazines - you get the picture. A woman behind me picked up the copy I had just put back (see, I do have will power). We were strangers. She asked if I was considering it as a purchase for me. I was. 'So you know what scrap booking is then'? She was quite surprised. Thought she was on her own in this small market town. I told her about the large community on her doorstep. Gave her details of what and where that I know about. She was amazed, thankful and we parted - she with magazine. It's up to her now though. And that's the other thing about this craft thingy..it sits and waits and it's entirely up to you. So why do I crop? It may be because its empowering! Here is a non traditional Christmas card - it is, really - see it has a snowman's face and 'Cool' and 'Yule' written on it as proof...it's for Susie and Vikki's challenge again, another one for my box - oh my, I'm so organised I might start writing in them as well! I had done some catching up and was sort of patting myself on the back about the state of my desk, but then it was WOYWW and good grief, so much to look at! Two things come to mind about 'the swing'; lots of us are making cards and a lot of us have a box to put them in, unused. We need an outlet! Secondly, it strikes me that (with the odd exception) our stash is stored in a fairly ordered and tidy manner. I get the impression that you could 'go to' any particular item on demand. And that's a good thing! The desk/surface then, is the epicentre of creativity, where you can sort of 'let it all hang'. Ruthie said that she felt 'cleansed' after posting her WOYWW with swing.....I kinda get that - if affirmation is the subliminal reason for blogging, then WOYWW exposure is perhaps a bit of the old shared guilt thing! Works for me. And talking of guilt - these inchies..A to D in alphabetical order (OK, ignore the 'let's) are for the weekly challenge over at Fiona's - I had and have every intention of playing but somehow the first 4 (weeks) got away from me! Huh? One inch square and you can't do 'em? I know! Problem here is that I need to have a use for them, I can't have them just sitting about - they'll end up in the bin out of frustration. So now I have (another) manilla notebook begging for decoration, ergo, suddenly I need to catch up with the challenge! With a little swing this morning.....to follow! Here's my desk. Photo taken about 5 minutes ago, in gloomy light. But, drum roll please....in line with one of my 'Intentions' this year, I've learned how to adjust the exposure, so of course, the picture is a lot less grubby looking - in terms of light! You can see the remnants of a card I've been working on - can't show you just now - it's a 'guest DT' slot card! Oh my dear, guest DT! It'll cost a shilling to talk to me at this rate! The guest slot is part of Susie and Vikki's 'prize' over at their Christmas Club challenge. What it actually means is an opportunity to sweat over two Christmas cards on a wet week in February instead of just rolling out one! You can see a print out from the PageMaps site - I was looking for inspiration for a mini album....these maps are lovely, so I may be OK for something to do at the Crop on Saturday! The jar of Primas is still there - I've used one flower since I last mentioned the bottle - it may have been a week ago, I can't remember; so having the bottle in front of me clearly represents a great success! OK, so I've swung right to show you the end of my desk that the camera usually misses. Large pile of stamps waiting to be cleaned. Not very exciting! Mr Dunnit built the unit for me in the corner of my room - the stamps need to be where I can see them - you can just about work out the big perspex box that holds my clear stamps. Still seeking a similar storage solution for them really. So that's me this Wednesday, about to clear up and get workshop cutting and counting underway before I visit your desks and drawers - swing whichever way, but swing! Show us what you're working on then - upload a photo of your work surface/space and then swing the camera round to show us a draw or other related space....we want to see what you've got and what you use! Upload it to your blog, leave a comment here and we'll swing by for a look around! Grab a button from the sidebar if you want to be a recognised WOYWWer! 2. I've decided what to do about my middle aged and horrible hair and it shall be done. Next wednesday at 9.15am. 3. Basic Grey - this would also appear on my top ten list of things that I'm scared of. 4. Planning a holiday; we do this a lot in this house. Plan. Two years since we executed a plan though. 5. The good, improving and better health of my beloved parents and in-laws. 9. My sisters and my er, sistahs (that's you, friend). 10. My blog. Corny huh, but it does make me happy. It lets me write anything and have an opinion and a laugh and it never bites, doesn't eat my sweeties and doesn't fall asleep while I'm expressing my opinion. Perfect! Of course, I could have listed my blessed life and the joy I getfrom being creative and the beauty I see in the world that so inspires me. But you'd recognise the bump in my cheek as my tongue and you'd know I was trying to be some sort of celebrity and then the list wouldn't be current, because all of that is a given, right?! And it is a current list. You may want to ask me again tomorrow when I've spent another 15 minutes in the Room of Shame. So far, all I can see happening is a redistribution of the stuff in there; so am thinking of giving myself permission to leave the job until the boot sale season starts up. There is one thing though, that I need you to know: despite my apparent lack of pride over the state of my workdesk every week, I will never, never ever, no way, post a 'before' picture of that room on this here interweb. I don't care if it's not as bad as any other RoS - it's mine and it's staying that way! Apart from a birthday or two, January 2010 has been exceptional for wrong reasons and I'm more than happy to remove the page from my board! So, welcome to over exposed and badly lit February! You can see that I don't exactly seem busy in terms of plans - maybe this will be the month of clearing and sorting then. Ha! I only say that because over the weekend, Mr Dunnit has been rummaging in The Room Of Shame - the spare room, filled with bits of furniture and toys that Miss Dunnit eschewed in favour of the new look bedroom. The stuff I've been threatening to sort out since then, you know. Well turns out that I might very well be in the mood. Is that the effect of waking up to a new month? I don't know. It could be related to the two magnificent full moons that shone on Friday and Saturday nights; or maybe it was the movies. We went to see 'It's Complicated'. It was fun, light, cheery and as usual, la Streep was marvellous, totally comfortable acting her age. Gotta admire that. Shocking to see Steve Martin in post plastic surgery mode. Ow. Why do they do that? And really, if it wasn't surgery - change it back! I digress - the house which was the major location for this movie made me swoon. So maybe I have deluded myself into thinking that clearing The Room of Shame will turn my house into a sea facing, low slung, neutral haven in Santa Barbara. Sure. Oh, definitely blame the full moon!